Jerry draws from more than 25 years of experience as a technology innovator and IT strategist to help Symphony Services and its clients derive business benefit from the successful adoption and use of critical technologies. Jerry is managing director at LiquidHub. Formerly, he was SVP and CTO at Systems and Computers Technology (SCT) and CTO at Semaphore. He also held management roles at Xerox, Sales Technologies and KPMG and was the principal owner of Market Place Technologies. Jerry has a Bachelor of Science Degree in Electrical/Electronics Engineering from California State Polytechnic University, Masters and Post-Doctoral degrees in Computer Science from NOVA Southeastern University and a Naval Nuclear Power degree from the US Navy, where he served as a pilot, nuclear and project engineer. He is an Adjunct Assistant Professor at Drexel University and an Adjunct Professor at NOVA Southeastern University. 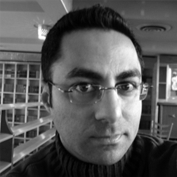 Ravi Singh is a user experience architect based in Houston, TX, with 12 years of web design and development experience, and 9 years of focus in user-centered research and design. He has often played the role of usability evangelist motivating product and development teams to adopt a user-centered approach. His professional background includes many years working for Fortune 100 energy companies, as well as well as extensive consulting experience across industries. He has designed and developed intranets, GIS interfaces, multi-media interfaces, content-rich websites and e-commerce sites. He has been an Axure user and advocate for 3 years and has conducted training for his staff and for clients. Ravi has a background in fine arts, with an MFA from the University of Houston and a BFA from the Maryland Institute College of Art. He also studied painting and stone carving in Lacoste, France and urban design in Saintes, France. Andrew Sickorsky, Senior UX-engineer at USABILITYLAB LLC. Former lecturer on applied math and Senior Software Tester. Works in field of User Experience for about 4 years planning and doing research, eye-tracking studies, prototyping and supervising colleagues in different aspects of research and design activities. Specializes in intranets, banking software and e-commerce sites. Main focuses are: holistic approach to User Experience/ Customer experience and mapping HCD (ISO-9241-210) to any development cycle. Author of several internal and external trainings on UCD/HCD methodology. Founder and coordinator of User Experience Russia community. Strongly believes in 2 things: 1) Ability to find the place for every product in people's everyday life for everyone's joy and satisfaction ("matching user needs to business abilities") and 2) Useful products save the world. I am an IA & UX Designer with about 15 years of experience in usability, conceptualization, creative strategy, graphics and web design. My consulting assignments over the years have provided me opportunities to work on a variety of projects in the media, gaming, finance and insurance industries and helped me develop a broad multi-disciplinary approach to requirement gathering, user experience design, information presentation, branding and usability. I advocate and try to practice the KISS (Keep It Simple Stupid) mantra in my projects, focusing on streamlined design, agile development and flexible, affordable, accessible and most importantly "usable" applications.